Here is essentially, a museum shop program. These are another segment of the train video market. Some museum shows can be: whimsical, vague, or ‘general public’ oriented. This one will be fine for the museum, while it also has an eye on the railfan. Southern Railway #401 is a beautifully restored, 1907 Baldwin steam locomotive. This consolidation is shown on it’s inaugural weekend of operation. Monticello Railway Museum is the location. The museum is located in Monticello, Ill. A wooden depot is here. A set of restored Illinois Central passenger cars are in this trains consist. One more car is lettered for Roanoke Chapter of NRHS. It is in the classic Norfolk & Western livery. A Canadian National steam generator car is finished in 1950’s era paint. A few EMD diesels make brief appearances at a Railroad Days weekend. An NW2 in Milwaukee Road 1950’s orange and gray. Illinois Central with the modern black on the rebuilt GP11. Norfolk Southern F9/7 A/B pair visit the event. The NS units are in Southern: black, white and gold scheme. A Wabash F7 is parked, a museum resident. There is some good narration in the first half of the program. No maps, but it appears to be a typical, out and back operation. Would have liked to hear, some detailed route/ trackage information. No chapter menu or previews. Use the next button on your remote, to access 25 chapters. On screen graphics or narration, will denote locations. The antique Baldwin steamer is a fine looking 2-8-0. Southern green paint is unique to that railroad. In a world of black locomotives, this scheme sets it apart. Throw in the dulux gold lettering and red paint, inside the bell. This is a memorable smaller steam engine! Some acoustic guitar music bookends the presentation. It is good and fits the subject. A well written script has a brief history on 401 and restoration background. More information is provided on museum equipment in a succinct fashion. Begins with a 2 car test run, before the big weekend event. Diverging Clear has a few cameras onboard the 401. A handheld in the cab, a running gear cam, another mounted on the tender. From the first chuffs, notice the clear sound of the locomotive. The way this segment runs, is a different viewpoint from the main body to follow. An overview of the Railroad Days is an interesting collection of material. In fact, the first half of this video provides the most variety. The second half is devoted to the sights and sounds of the 401 train. No narration and none needed on the second half. Natural sounds with the on screen graphics. There are many views of the train. It is the same train at various locations on museum trackage. Some pretty scenes in wooded areas. Other shots in the town. Natural, outdoor lighting does vary, along with some cloudy weather conditions. Obviously, the cinematographer has taken care with composition. The camera is steady. Audio goes to the environmental sound for the bulk of the program. Professional and consistent. Excellent image quality overall. Some cloudy weather shots are a slightly dark, the undercarriage, and trucks mostly affected. . Audio is great! You hear the steam engine, at work. The steam whistle is a classic. That ringing bell will clang in your ears! Those sound like crickets, or locusts in the woods. Do the birds sound like they are in your room? The single focus on a restored locomotive is a common theme with train videos. Understandable, as vintage steam in operation is restricted to museums or excursions. Inherent in these train videos, is the repetition of any given train. These single locomotive features are very specialized shows. Appeal is a major factor. This will make a fantastic souvenir for the right crowd. It is also great for Southern Railway fans. 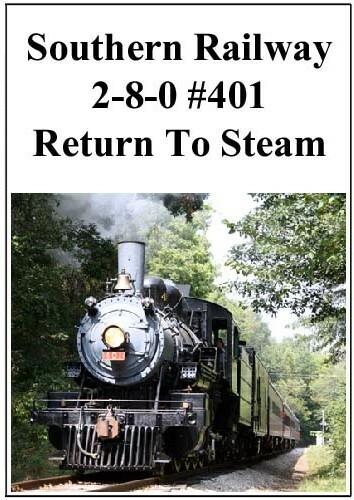 Steam fans will get a trainload of 401 operating. Interest level will vary with others. So it goes with museum trains. All of this goodness, does give a worthy visit with Southern Railway #401. Contemporary film equipment is advantageous for trainwatching . The modern era viewer may prefer this over vintage steam films. The scenes are clear and artfully composed. It is a fine show for those with the desire to see this train in operation. This entry was posted in ATVR Reviews, Diverging Clear Productions, Steam Train Reviews and tagged American Train Video Reviews, new releases, Railroad, steam train, Train DVD by William J. Hudson. Bookmark the permalink.